Up until last Thursday, I don’t think I had ever actually seen a professor up close. I mean, sure, I’ve sat front row in lecture or passed them while walking to class, but I am really bad at actually talking to my professors. I never bring my questions to them after class, or go to their office hours. I do all of these things with my TAs, but something about actually talking to a professor intimidates me. I think that I’m always worried I’ll sound stupid, or that I won’t have anything worth occupying their time with. When in reality, my philosophy professor would probably actually enjoy discussing Plato with me. I mean, isn’t that kind of why you become a teacher? To teach. So when I was invited to the UCLit Coffee with the Profs: A Panel Discussion on Poverty and Homelessness, I immediately thought no way! What could I possibly bring to this discussion that one of the expert panelists couldn’t say better? Do I even know anything about poverty and homelessness in Toronto? Do I even know ANYTHING AT ALL?!!?!! But doing things that are out of my comfort zone was one of my new school year resolutions, and has created most of my other content here on the blog. I survived all those other awkward situations, so why not this one? The layout of the panel! 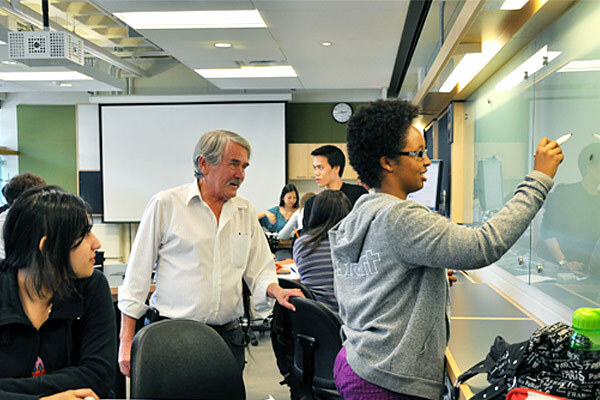 Coffee with the Profs is a regular event held by the UCLit. Anyone can come, and each event has a different theme or topic. Some, like this one, are panel-style, while others are more of a social and networking event. The atmosphere is always casual – they order pizza and make a cozy corner of couches in the JCR – and there are UCLit reps scattered throughout the group to ask a question when things get awkward and silent. The panel I attended was more of an informal round-table discussion than a panel, and included Professor Hulchanski from the Centre for Urban and Community studies, Poet Laureate George Elliot Clarke, and Jesse Surdigo from the Yonge Street Mission. Each guest brought a different perspective to the topic as they discussed questions such as; what is poverty, why is it so difficult to escape, and what can we be doing to help? I found that although I didn’t have a wealth of knowledge on the subject, I was able to ask more specific questions about what was being discussed – rather than overarching philosophical ones. I actually ended up leaving the panel having formulated the beginning of my own opinion on the subject. I overcame my fear of feeling inadequate in the presence of professors, and learned some new things in the process. 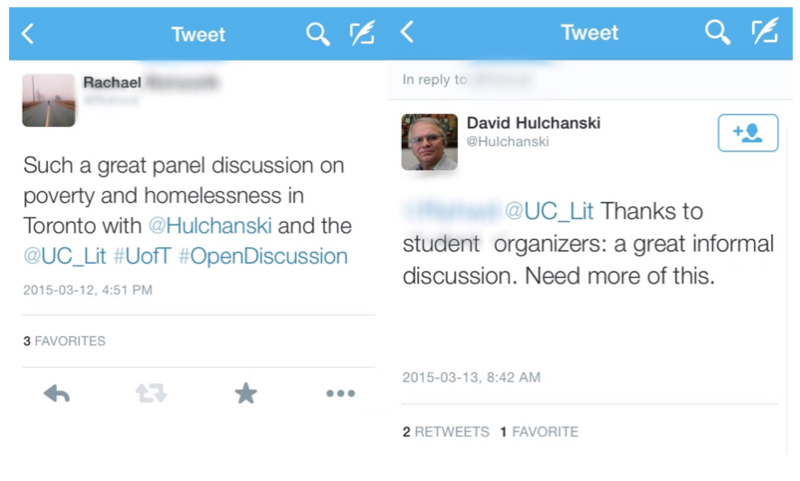 I even engaged in a bit of twitter-talk with Professor Hulchanski after the panel! If you’re nervous about talking to professors, I would definitely suggest hitting up one of these events! The informal setting makes it a lot easier to interact, or to just sit back and watch if that’s what you’re more comfortable with. I would also suggest going if you’re particularly interested in one of the topics, as it’s a great place to share your passion with other academics and students. 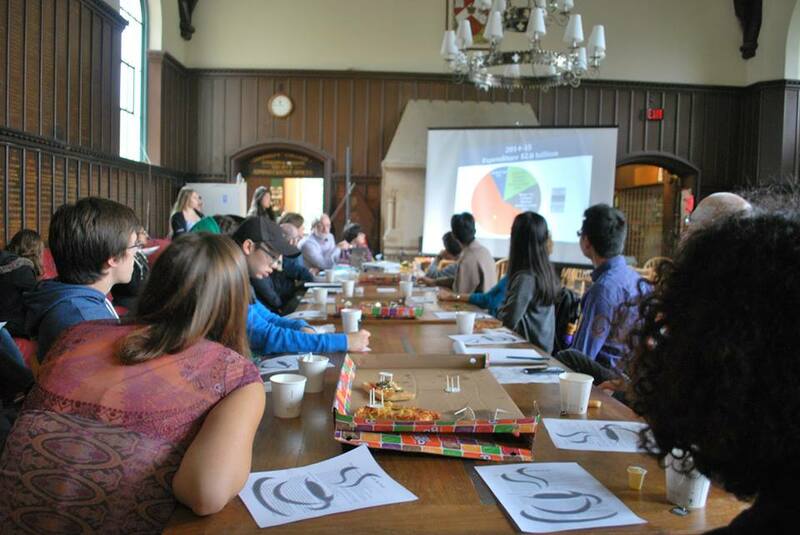 Congrats to the UClit on hosting such a great series of events! I can’t wait to see what topics you bring up next! Next Post Happy Birthday U of T!